Labour Party leader Jeremy Corbyn is trusted by the public just as much as ex-Prime Minister Tony Blair on defense issues and his ability to keep Britain safe, according to a new poll. 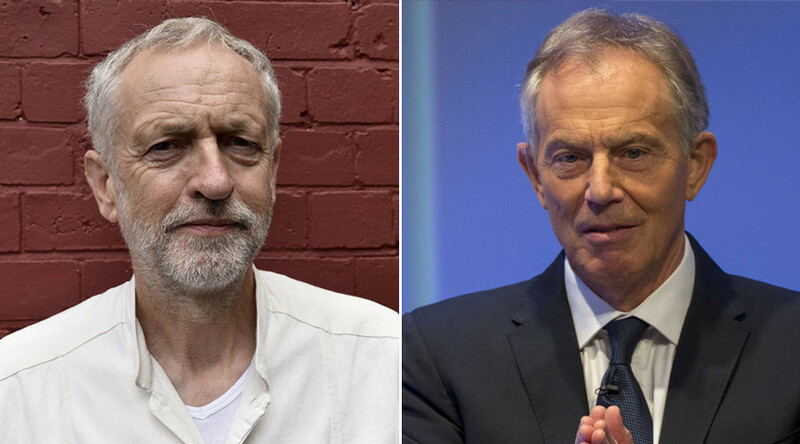 The study, commissioned by the Independent, claims that five out of six voters have more faith in Corbyn than Blair. While 16 percent think Corbyn is strong on security issues, compared with Blair’s 14 percent, 54 percent feel neither is trustworthy on public safety. On a partisan level, Conservative voters were not remotely impressed by the serving Labour leader, while Labour supporters had significantly more trust in Corbyn. “37 percent of Labour voters at the last election said that they trusted Corbyn most, with just 20 percent for Blair (32 percent neither, 11 percent don’t know),” polling agency BMG said on its website. Corbyn has faced repeated attacks from the press and rival politicians over his stances on security issues, not least over Britain’s Trident nuclear weapons program. Labour’s policy on nuclear weapons is currently under review by, among others, former London Mayor and Corbyn ally Ken Livingstone. It is rumored the defense review will be completed within eight to 10 weeks, in time for a parliamentary vote on Trident renewal. Pro-Trident MPs fear it could reverse Labour’s 25-year history of support for nuclear arms. “We will desperately try and do it as rapidly as possible,” Livingstone told the BBC on Wednesday. An anti-nuclear stalwart, north London MP Emily Thornberry was recently given the shadow defence secretary role in Corbyn’s cabinet reshuffle.